Buy Before They Sell Out! 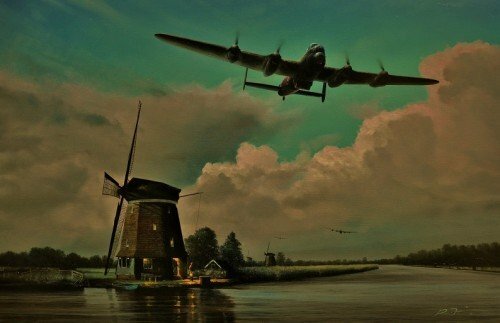 "On Course for Moehne Dam"
This New Release by Richard Taylor depicts Guy Gibson leading the first wave of 617 Squadron Lancaster bombers towards the German border, and on to the Moehne Dam. After crossing the coast a fraction off course, Gibson adjusts his compass heading slightly and, as the unmistakable thunder of 12 cylinder Merlin engines at full throttle shatters the night, follows the course of a large canal - where the owner of an ancient windmill, hearing the noise, hurries outside to witness the event. Signed by SQUADRON LEADER LES MUNRO,, CNZM, DSO, QSO, DFC - The Captain and Pilot of Lancaster AJ-W assigned to attack the Sorpe Dam and SQUADRON LEADER GEORGE 'JOHNNY' JOHNSON, DFM. "THE FEW - The Women Who Flew The P-38"
Motor Racing, Classic Cars and more!